“The company [Pierce Corporation] that manufactures and engineers center pivot irrigation systems for farms had moved a warehouse to Idaho just over a year ago, but according to director of operations Ron Gray, issues with snow made the situation untenable, leading to the search for a new home. As it turns out, Idaho’s loss is Grand Junction’s gain as the corporation decided the Grand Valley was an ideal fit for the new main warehouse location. The company got the keys to its building on a 4.7-acre lot at 848 21½ Road in early September and has been moving its operation since then. Pierce was founded in 1932 and is headquartered in Eugene, Oregon. Gray said the plan is to have about 15 employees in Grand Junction with the potential to expand. The company also has a warehouse in Georgia and sites in Australia, New Zealand and other overseas locations. Aside from Gray and two other employees who will relocate, the rest of the warehouse will be staffed locally. Gray said he’s already hired one full-time employee from Delta and has several temporary employees that will soon have the possibility of coming on permanently. While it was snowy in Idaho, Eugene is also known for its rain. As a result, the extra days of sunshine in Grand Junction were appealing. ‘When it’s sunny and not pouring down rain, it’s a lot easier to make this happen,’ Gray said, adding that a more central location is also ideal for the trucks that bring shipments in and out of the warehouse from across the nation. The Grand Junction Economic Partnership worked closely with Pierce as it looked to move to the Grand Valley and helped the company find a suitable building. Correction: Pierce Corporation will go with GJEP to Denver in December to go in front of the Colorado Economic Development Commission to be approved for the Rural Jump-Start Tax Credit program. Two more companies new to Mesa County are expected to join them. Is the weather really that great? Find out more here. Can my business qualify for a tax holiday? Learn about Jump-Start here. 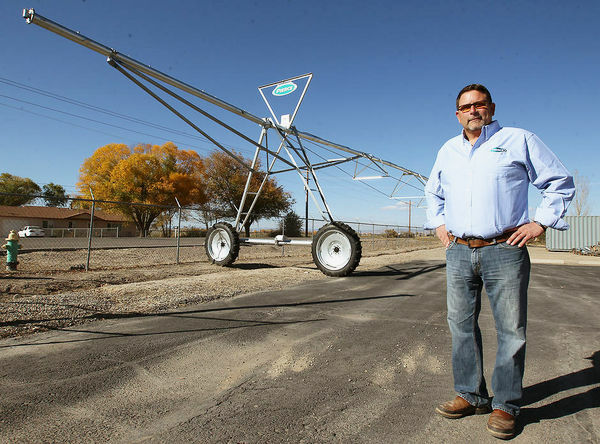 Photo from The Daily Sentinel article on Pierce Corporation features Ron Gray, director of operations, standing beside a standard irrigation system outside of the company’s new main warehouse in Grand Junction.